On his way to visit the Queen of the Garden of Light, the Sage of the Garden of Clouds accidentally drops the egg of the Houhou. The egg lands in the Garden of Rainbows, where it is found by Hikari, attracting the attention of a powerful pair of servants of the Dark Lord. Watch Futari wa Precure: Max Heart Movie 2 - Yukizora no Tomodachi Episodes Online at Animegg.org. 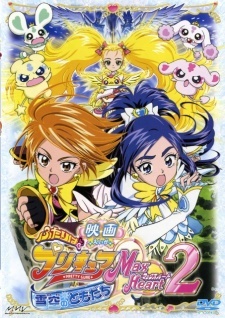 Futari wa Precure: Max Heart Movie 2 - Yukizora no Tomodachi is available in High Definition only through Animegg.org. Choose an episode below and start watching Futari wa Precure: Max Heart Movie 2 - Yukizora no Tomodachi in Subbed & Dubbed HD now.